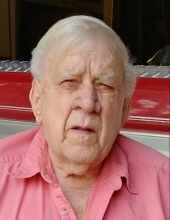 Robert "Bob" Dean Witte, 88, passed away of natural causes on February 7th, 2019, at his home in Great Falls, Montana. Bob was born February 27, 1930 in York, Nebraska to Edwin and Sophia Witte. Bob ran away from the family farm to join the military when he was only 17 years old. He became a Paratrooper with the 82nd Airborne serving proudly in the Korean War for 4 years. He loved to tell his war stories such as the one where he was hidden for 3 days amongst the enemy while waiting for the American Troops to come along. Bob was honorably discharged. Bob returned home for a short time before moving to Great Falls Montana where he met the love of his life Winnifred Deloris Sutherland. Bob and Deloris were married for 33 years before her passing in 2000. Bob was a loving father who devoted his life to his family. He was a member of the Carpenters Union. To know Bob was to love him... though some thought it difficult to get past his gruff exterior. If they ever did, they would know the truth. That Bob had a heart of gold, a wonderful sense of humor, and a desire to tell the stories of his life. He is lovingly remembered by his five children, Caria Peterman, Vickie Moore (Rick), Kathy Tome (Gary), Josh Witte (Pam) and Jeff Witte (Lynn); his eleven grandchildren; and 15 great-grandchildren. To plant a tree in memory of Robert "Bob" Dean Witte, please visit our Tribute Store. "Email Address" would like to share the life celebration of Robert "Bob" Dean Witte. Click on the "link" to go to share a favorite memory or leave a condolence message for the family.